Our Senior ladies got their championship campaign off to a great start on Sunday morning with a comprehensive win over Padraig Pearses. Kilbride dominated the game from the throw in and were well in control at the half way leading 2-08 to 0-01. The second half was a case of more of the same with Kilbride finishing with an impressive tally of 4-12 to Pearses 2-04. Team : Lorraine O Connor, Jennifer Fannon, Yvomne Creighton, Aoife Feely, Siobhan Tully, Rochelle Mullaney, Katie Kelly, Tara Taylor, Alice Kelly, Eilish Fannon, Casey Keane, Blaithin O Beirne, Fiona Tully, Sinead Clabby and Corina Gormley. 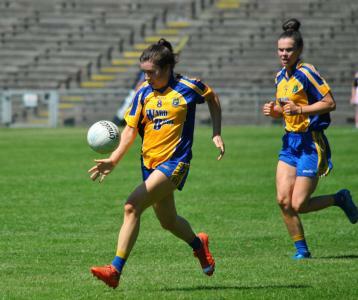 Subs Aoife Leonard for Casey Keane, Aoife Tully for Alice Kelly, Amanda Gavigan, Rachel O'Grady, Shauna Mannion Feely, Jacinta Tully, Mairead Tully, Niamh Tully, Roisin Tully. Best wishes to Casey Keane who picked up an injury in the game. Next game will be a much tougher encounter with an away game against Clan na nGael fixed for next Sunday at 12 noon. Good luck to all involved. The Junior ladies played their championship game on Sunday evening against neighbours Roscommon Gaels in Lisnamult. The teams were evenly matched and Gaels lead by 1-05 to 1-03 at the break but they should have been further ahead having missed several scoring opportunities. Kilbride sarted the second half strongly scoring a goal and a point in the opening minutes. There was never too much between the teams and they finished all square at 3-07 a piece. Next game is against St. Croans in Enfield and is fixed for next Saturday evening. Team : Rachel O Grady, Amanda Gavigan, Lorna Flanagan, Elaine O Grady, Saoirse Murray, Niamh Tully, Robyn Dowling, Roisin Tully, Mairead Tully, Enya Neary, Eleanor Walsh (0-01), Shauna Mannion Feely, Jacinta Tully, Patricia Shally ( 1-02), Aine Griffin (1-01). Subs Sandra Shanagher (1-00) for Shauna Mannion Feely. Best wishes to Shauna Mannion Feely who picked uo an injury during the game . An understrength U 14 team travelled to Four Roads for their first outing in the summer league but were defeated. Next game is at home on Thursday evening, time and opposition tbc.